A cynical mind could defend that the ultimate goal of both education and sports is to rank people according to intellectual or physical ability, and this at all levels. At the top of the pyramid, MBAs tend to be regarded as the most prestigious diplomas, while high-flying professional leagues, such as the Barclays Premier League in football, dominate the world of sports. Interestingly, interesting parallels can be drawn between those two areas. I have listed 8 points, but I am sure there are many others. I have split this post in two parts to make it more digestible. The second half will follow early next week – in the meantime please feel free to comment and add your own. The objective economic value of both MBAs and the Premier League is debatable: For MBAs the question has been around for years, and actually a straightforward Google UK search for the terms ‘Is it worth doing an MBA?’ will return an excess of 24 million results. The opportunity cost of taking one or two years off often outweighs the accelerated career progression an MBA promises – and even when it happens it is never possible to cleanly delineate the benefits directly attributable to MBAs. When it comes to the Premier League, one could adopt a relatively harsh viewpoint and declare that this competition does not manufacture any product or does not create any value-added service – although this statement obviously neglects the economic activity induced by the organisation of such events as well as the social and health benefits of physical exercise. 2. Competition between top schools/clubs is increasing and happens on a worldwide basis: MBAs have been fighting against each other for years, trying to make it to the top of world-famous rankings such as the Financial Times’ Global MBA ranking. Competition has undoubtedly reached a worldwide scale if we look at the origin of the business schools contained in the latest FT ranking: 19 countries are represented in the top 100, from the US (50 schools) to the UK (13), China (6) and more ‘exotic’ locations such as Portugal (1) or South Africa (1). In football, the 1995 Bosman ruling facilitated the transfer of players within the EU and the net has since then widened to allow clubs to recruit a limited number of non-European players. 3. The price for top talent will keep rising: In football, the globalisation of the market for top talents, coupled with the development of football as an economic powerhouse, has led to an explosion of the price paid for top players. A Wikipedia article has listed the highest player transfer fees over time. Even when adjusting for inflation, some of the best players of the past decades would be considered as bargains by today’s standards: Johan Cruyff’s 1973 move from Ajax to Barcelona cost the Spanish club the equivalent of a mere £922k and no transfer fee had ever exceeded the £15m mark before 1996 with Alan Shearer – the same mark would apply to an ‘average plus’ player today. Since then inflation has been more and more pronounced, culminating with Cristiano Ronaldo’s and Gareth Bale’s transfers to Real Madrid for £80m and £85m at the beginning of this decade. The rising role of Mid-Eastern and Asian clubs witnessed during the recent transfer windows – in particular China last month – will only accelerate this trend. Competition for MBA students has not reached this extreme – and will likely never do so -, although an interesting article from the Financial Times concludes that business schools are more and more using their scholarships as a way to attract the best students rather than broadening the pool of potential applicants. On top of fiduciary benefits some schools also offer ‘benefits’ such as “preferential access to certain faculty members or guest speakers” according to the same article. 4. Schools/clubs are building a strong intake/team not only to reign now, but also to facilitate recruitment in the future: The quality of the alumni network is a key component of the MBA offering and top business schools need to maintain their status as a regular supplier of blue-chip executives. The recruitment of high-quality students can therefore be considered more as a long-term investment aiming at improving the executive pipeline in the future – for an example see this page listing selected famous Harvard alumni. For football clubs, the recruitment of a star is a way for a club to signal a step change in standing and to lure other strong players as part of this ‘transformation project’. Putting aside Real Madrid, who has been spending huge amounts in top-class players for years, Fulham for instance (unsuccessfully) tried to do so in the early 2000s, then Manchester City, and more recently Paris Saint-Germain with the recruitment of Zlatan Ibrahimovic, without whom PSG would certainly not have signed the likes of Di Maria, Cavani and Thiago Silva. Is the Western oil & gas ecosystem collapsing? As the crude oil prices start their second month under the $40 a barrel barrier, the large-scale effects of low oil prices are starting to become apparent. Chesapeake Energy, the second-largest gas producer in the US, and Saipem, the Italian oil services company, took well-covered large hits in the stock markets yesterday and today – Chesapeake’s stock is now down 51% over the last month and Saipem’s is down 48%. Chesapeake had to dismiss rumours that it hired Kirkland & Ellis to restructure its debt while Bernstein advised investors to stay away from Saipem’s planned capital raise, according to Les Echos. 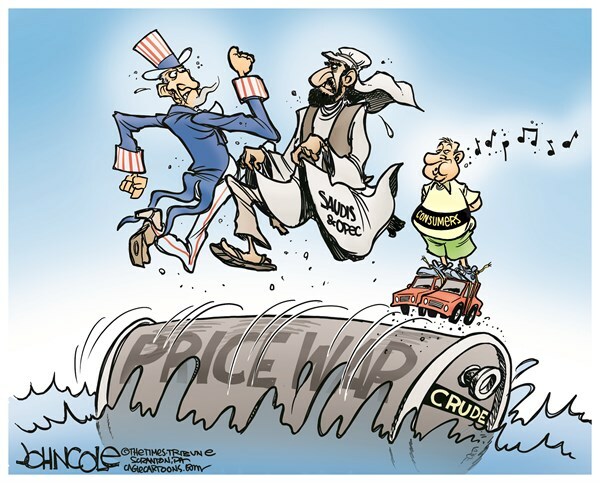 We may thus be entering a new phase in the ‘deep pocket’ war that the oil market has become over the last few months. The cash reserves that oil companies had put aside for ‘tough times’ are running empty, and the cracks we are witnessing today are probably only the first ones in line. The risk of contagion is indeed not negligible. As rightly pointed out in this article from Reuters, Chesapeake is legally bound to oil infrastructure providers, for instance pipelines, through significant (several billion dollars a year) long-term contracts. No surprise then to note that Williams Companies’ share price was also down 35% for the today (9th February) and almost 50% down over the past 30 days. So why not a pure write-off? First, these companies can rely on a cushion of tangible and partly re-deployable assets. Since the start of the year, companies in the industry – including Saudi Aramco – have been said to consider either raising capital (including through an IPO in the case of Aramco) or selling assets – both methods have equivalent impacts on net debt. The latter is a short-term solution that Chesapeake could well be tempted to consider. Second, the evolution of the share price is also a proxy for the expected evolution of the oil price in the future: shall the share of unprofitable US production sources remain high in the long term, the investors will lose faith in the potential recovery of the market and may decide to further turn their back on O&G stocks. Update (10/02): This very interesting piece of analysis from Wood Mackenzie confirms the $30 a barrel environment leads a very large share of oil fields to be run at a loss. Update (29/02): Chesapeake reported last week a $14.9bn loss. At the same time, Les Echos reported that petrol funds were to sell $400bn in assets. Author Quentin ToulemondePosted on 9th February 2016 4th May 2016 Tags crisis, macro, oil & gas, worldLeave a comment on Is the Western oil & gas ecosystem collapsing?